Read the entire evacuation plan carefully now! You will not have time if it should ever become necessary to leave your home quickly. This plan is updated as new information becomes available. • Ready – Be Ready, Be Firewise. Take personal responsibility and prepare long before the threat of a wildland fire to Crystal Park so your home is ready in case of a fire. Create defensible space by clearing brush away from your home. Use fire-resistant landscaping and harden your home with fire-safe construction measures. Assemble emergency supplies and belongings in a safe place. Plan escape routes and make sure all those residing within the home know the plan of action. Contact CPFD for Firewise evaluation. • Set – Situational Awareness. Pack your emergency items. Stay aware of the latest news and information on the fire from local media, the CPFD website and public safety. • Go – Act Early! Follow your personal wildland fire action plan. Evacuate early. Doing so will not only support your safety, but will allow CPFD and incoming firefighters to best maneuver resources to combat the fire. The El Paso County Emergency Notification System, sometimes referred to as Reverse 911, will be the primary way that you will be notified of an emergency in Crystal Park. Your land line is already in this notification system, but you must take the extra step to register your cell phone or a VOIP phone. Please do so immediately. Register your email address with the Crystal Park Metro District in order to recieve updates by email throughout an incident or evacuation. Contact cpmetropolitandistrict@gmail.com. You might also check the front page of this website frequently, as updates will be posted there. Crystal Park’s single evacuation route is the paved main road – Crystal Park Road. It is possible that egress will not always be possible, so be prepared to go UP rather than down! Know the established Staging Areas (SA) depending on your location and nature of the emergency. There are 6 staging areas that will become CPFD checkpoints where residents should gather both for accountability and for potential evacuation by helicoptor or until the main road is clear. Staging Area 1: SA1 is located at the lake in the Upper Park. SA1 is considered the primary safety area and will be the location where the CPFD will establish Upper Park resident accountability. All residents will stage from this primary safety area until such time as they are evacuated down Crystal Park Road or via helicopter from the Lake helicoptor pad or the Cone pad. An initial Checkpoint will be established at the lake to account for all residents being evacuated. Staging Area 2: SA2 is Flat Rock in the Pike National Forest. If required, staging from Flat Rock supports Cone evacuation operations. A Checkpoint may be established at Flat Rock to account for all residents being evacuated from this location. Staging Area 3: The Lower Switchback (where the Historical Turntable is located) represents another safety area that may be used if needed. The CPFD will establish a secondary evacuation Checkpoint at the Lower Switchback to maintain resident accountability during any evacuation. Staging Area 4: Railroad Grade represents another safety area that may be used if needed. The CPFD may establish a secondary evacuation Checkpoint at Railroad Grade to maintain resident accountability during any evacuation. Staging Area 5: SA5 is located in the open area approximately a half-mile from the gate. This area is large enough to ensure resident safety in the event complete evacuation out of the gate cannot be accomplished. A Checkpoint may be established at this location as required otherwise residents will continue to the gate to complete Crystal Park evacuation. Staging Area 6: SA6 is located in the large open area at Scrub Oak Road. This area is large enough to ensure resident safety in the event complete evacuation out of the gate cannot be accomplished. A Checkpoint may be established at this location as required. Crystal Park maintains two helicoptor pads that can be used for medical emergencies and possible evacuation. Both pads are located in the upper park: one is on Palmer Trail just past the lake on the left. The other is located on Deer Mountain Road: Take Eagle Mountain to Methuselah; Methuselah to Deer Mountain Road. The Emergency Shelter-In-Place (SIP) is designed for safety from wildland fire. It is the last resort in the event that residents have safely made it to SA1 and it is determined that there is a need to muster in the SIP as dictated by whatever fire behavior we may be dealing with. The SIP is located on Maintenance Road and there are two signs --one on Palmer Trail and one on Waterfall Loop--pointing the way to the facility. 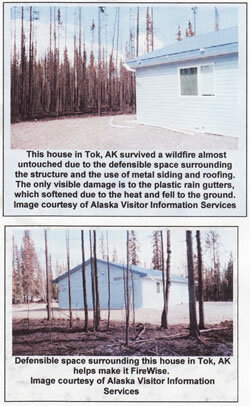 Pictures from an Alaskan wildland fire clearly show how well an all metal building with defensible space will survive a wildland fire. The Crystal Park Shelter-in-Place is completely clad in metal; and a wide berth of open space protects it from fire.